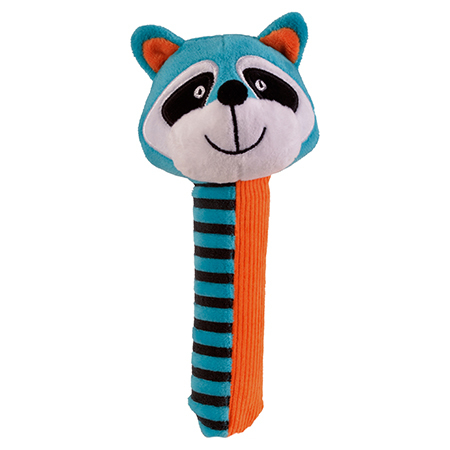 Product Page - Raccoon Squeakaboo! We thought this was a simple yet brilliantly stimulating toy and its great for catching babys attention  our testers loved looking at the bright colours, squeezing and shaking the rattle. The Squeakaboo! rattle can support physical development in several ways; getting baby to watch the rattle moved in front of her improves visual tracking and strengthens neck muscles, squeezing the toy is excellent for strengthening hand grip (known as fine motor control) and shaking it is wonderful exercise for arm muscles and coordination (known as gross motor skills). Meanwhile, babies are also learning about cause and effect which develops their logical thinking  when they shake or squeeze the toy it makes a sound. The variety of sounds further stimulates babys senses, however we did find that the squeaker sound could be startling to young babies (under around four months  this is known as the Moro reflex), which parents might want to be aware of. The hugely popular Squeakaboos! soft toy rattles make the perfect toy for babies from birth to a year old. They jingle, crinkle and squeak when squeezed, making them a great interactive first toy for little ones. The Squeekaboos! range helps baby to begin learning all about sounds and touch in a tactile way, and through role play with mum and dad, helps encourage interactivity while ensuring lots of smiles, fun and giggles. Product Feedback for Raccoon Squeakaboo!